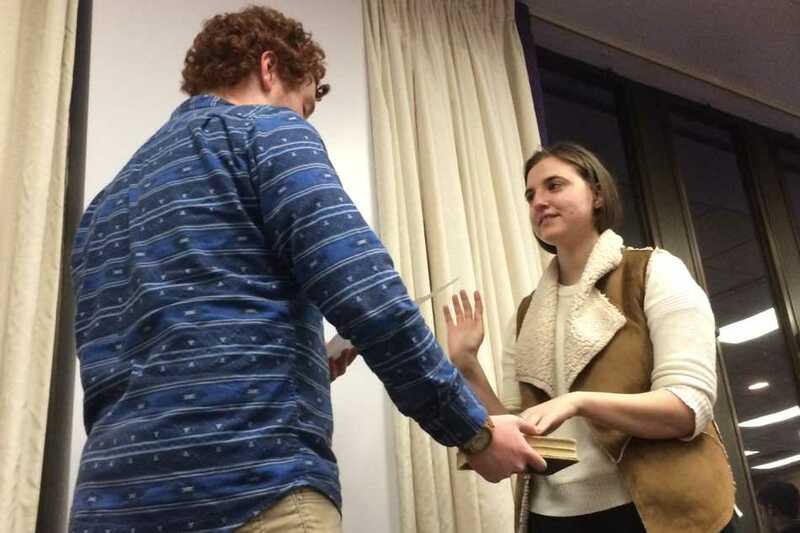 Speaker Noah Star swears in Weinberg junior Mackenzie Schneider as vice president for A-status finances at Senate's March 11 meeting. She will oversee funds given to A-status student groups​. Associated Student Government Senate unanimously confirmed two vice presidents at its Wednesday meeting before approving B-status group funding for Spring Quarter. Weinberg junior Mackenzie Schneider was reconfirmed as vice president for A-status finances. Weinberg junior Parag Dharmavarapu will be the new vice president for student activities. Schneider’s job entails overseeing funds given to A-status student groups — such as A&O Productions — that receive a larger share of ASG funding. ASG President Julia Watson praised Schneider and said having a veteran member is crucial as ASG considers reforms to its funding system. Senate also confirmed Dharmavarapu as the new vice president for student activities. His job will include advocating within ASG on behalf of student groups. Dharmavarapu said his involvement with the South Asian Student Alliance shaped his view of student groups’ role on campus. Senate also increased funding to some B-status groups, which are groups that generally receive a few hundred dollars from ASG quarterly. At Senate’s March 4 meeting, vice president for B-status finances Kenny Mok said B-status funding requests totaled $38,706 for Spring Quarter 2015, about $10,000 more than total requests last spring. The committee left $806 in “amendment pool” funds for senators to allocate. Senators approved a motion to give A-NU-Bhav, a Bollywood-inspired dance group, $100 for props. Northwestern Ballroom Latin and Swing Team received $250 to help cover costs for an instructor for spring classes it offers. Senate rejected Northwestern AIESEC’s request for an additional $250. ASG allocates $1.4 million to groups every year, and most of that funding comes from the $56-per-quarter ASG activity fee students pay.